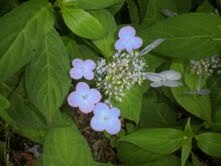 I am really grooving on the hydrangea this year. 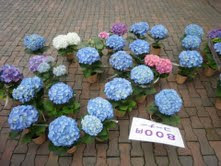 For the second year in a row, I dragged Abby to the Ajisai (hydrangea) Matsuri (festival) inside Toshimaen amusement park. 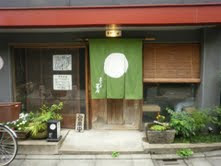 I had to bribe the girl with soba and sora mame (grilled fava beans) but it was well worth the effort on every front. This year we decided we would be better able to appreciate the floral displays if our tummies were full. So our adventure started with a stop at a favorite noodle shop, just outside the park precinct. We stumbled upon it last year when we attended the fair with close friends and have been hankering to go back ever since. 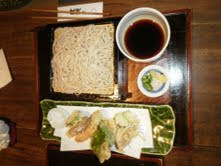 Abby opted for soba with vegetable tempura. Favoring seasonal delicacies, the selection included sora mame, avocado, asparagus and several other more conventional offerings like pumpkin, sweet potato and burdock root. I went for the soba with sesame dipping sauce -- not an easy choice since last year's walnut sauce was exceptionally delicious. We shared a side of the grilled beans. Earthy, soba tea accompanied our meal. In addition to excellent ingredients prepared with the utmost care, the food is beautifully presented. In keeping with the shop's retro feel (in one corner a 60s vintage TV shows a continuous loop of programs from the era), each edible is served in a beautiful but well loved dish of its own, some the products of studio potters. The assorted vessels are united by a lacquer-coated, wooden tray that is tastefully chipped and worn from use. Both food and container are full of aji (= character and flavor). 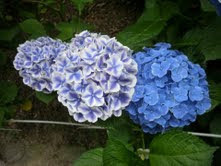 Now back to the ajisai. The flowering bushes occupy a corner of the park, set apart from the flashing neon lights, garish signage and roaring roller coaster. Grouped by type, they cover the hilly terrain. 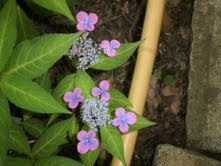 The lush green foliage dotted with clusters of deep blue and purple blossoms are a winning combination if ever there was one. Strolling among the flower-bedecked paths is magical. Mature trees at the perimeter cast a little shadow on the garden and mist intended to moisten the flowers fills the air, creating a benevolently mysterious atmosphere. The whole setting reminds me of the fantasy cartoons of my youth -- think Flintstones, Jetsons and Peter Pan, the Disney version. The colors are so intense, they are almost out of this world. 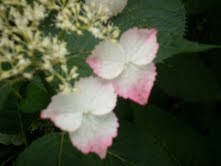 I must admit that my appreciation of ajisai caught me by surprise. It started with sakura, the cherry blossoms I came to adore after living in Japan for a year or two. While I love watching people love the flowers (in this case mostly old ladies and camera buffs), I am even more taken with the ajisai themselves. 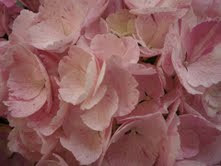 The endless variations in petal shapes. The intense colors. 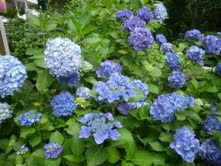 The size range from dainty houseplants to cascading bushes. If you share my enthusiasm, please leave me a comment. 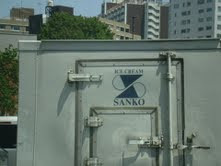 The other day I pulled up behind a delivery truck at the Nishi Azabu crossing. While waiting for the light to change, I studied the the company logo emblazoned on the truck's behind. 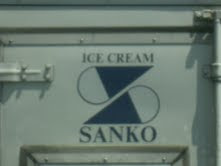 It took me a moment or two to figure out that the sideways ice cream cones add up to a stylized "S" as in the brand name "Sanko". I quite like this graphic though it challenges my design sensibility. In America, the vertically oriented, cone-and-dome combo is such an icon -- I probably would not mess with this. But in Japan, where that association may not be so deeply entrenched, it is totally cool. On Sunday the most wonderful gift arrived via same day takkyubin delivery service. I knew that something very, very special was in store for me when the Styrofoam cooler chest made its appearance. And let me tell you, the contents most definitely did not disappoint. After unfurling the tape that held top and bottom together, I lifted the lid and there, lying comfortably in their bubble wrap beds, were five, absolutely perfect artichokes. They have that majestic globe shape and their leaves are a lovely segue of green to purple -- reminders of their membership in the thistle family. While the four on top were trimmed to travel size, the grand finale was on the bottom where its stalk could stretch the box's full length. It seemed a shame to eat them! But eat them I did. I just steamed them, scraped off the tender flesh and savored their sublime flavor. No need for any flavor enhancers. The opposite experience from downing that worm-riddled artichoke I ate in Palo Alto (and still remember vividly) at the ripe age of 8. 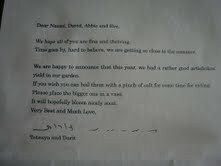 These big bulbs come from the suburban Tokyo garden of dear, dear friends who have honest-to-goodness green thumbs. 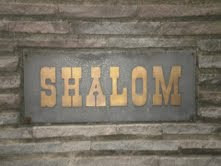 I am in awe of their ability to produce such divine treats. And I deeply appreciate having the chance to share any of their bounty. 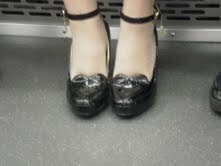 On the way to Asakusa on Sunday, Abby and I stumbled upon some amazing footwear. These zebra-toned platforms are simply to die for (if they don't inflict bodily harm on their owner first!). I suppose platforms are a gift to the short people in the world. But I feel for her ankles. Does walking around in these things qualify as risky behavior? On the rebound subway ride, we sat opposite this pair of lovelies. I can only imagine the blisters and bruises caused by those heart-shaped panels. But it is the blingy baubles dangling from the ankle straps that really caught my eye. Oh, where are the fashion police when we need them?